CUTTHROAT TROUT - Was this fish named for Al Capone or Jack the Ripper? World Record Cutthroat Trout is 41 lbs. This one is a bit smaller. 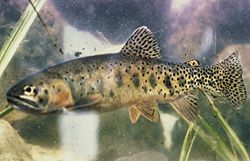 Now we have all that out of the way, the cutthroat trout is a member of the salmon family, but is called a trout by everyone. These lovely, delicious swimmers are native to the western part of North America. Like its close cousin, the Rainbow Trout, there are varieties that spend a great deal of time in the ocean. These are called anadromous or migratory species and must return to fresh water to spawn. However, most cutthroats spend their lifespan in fresh water. Cutthroats are easily identified by colored marks underneath the lower jaw. All species of cutthroats have this coloration. These west coast stream dwellers can live to about 8 years and weigh up to around 5 to 6 pounds, although larger ones have been reported. The cutthroat eats by opportunity and adults will gorge themselves on whatever is floating by. Nothing like Morris the cat, just about anything offered up by nature is on the cutthroat’s dietary plan. Eating will occur several times a day and will include insects, crustaceans, and other fish as well. Yes, the cutthroat is a bit cannibalistic that way. Fishing early in the morning when the water is still cool is popular among anglers. Then again in the evenings around dusk or close to it, for the same reasons. From March to August is when the cutthroats get ornery and really stay active. This is the spawning season as well, and many of nature’s babies get aggressive when it’s time to reproduce. Must be the testosterone in the males or something. Get some butter, white cooking wine, and a bit of garlic. Basically, this is a trout, so it can be treated like any trout. Baking, frying, or broiling is acceptable, but the butter is a necessity. The garlic is a choice of mine and the wine is entirely optional (just don’t tell Emeril I said that). Use the spice of your choice to add some BAM! to your cutthroat recipe. Like any fish, cutthroat is best served fresh within 24 hours of catch. They should always be kept cold and packed in ice until cooking time arrives. Pack the body cavity (gut it first, silly) with ice. This will keep it fresh for 24 to 48 hours. If you need to keep it longer than that, put the chilled fish into a plastic bag, remove all the air, and freeze it. Cutthroat trout have many various colorings but the main identifying mark is the coloring underneath the lower jaw. This marking is very hard to miss. Cutthroat trout are closely related to their other trouty cousins. All are members of the Salmoniformes order and the Oncorhynchus genus. Cutthroats look like rainbows except for the coloration differences. 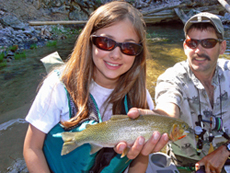 Cutthroats can be green, brown (as the brown trout), and even red over yellow. There are several sub-species of the Cutthrout trout including the Westslope CT, Rio Grande CT, Greenback CT, Mountain CT, and Yellowfin CT. Again, coloration is the main difference between sub-species. They all have that slit cut throat look, though. Cutthroats are more of a homebody as they stay where they have spawned for most of their lives. Types of both species do migrate to saltwater, but rainbows (as steelheads) are more migratory than cutthroats. In order to preserve the species, please remember to follow the rules. 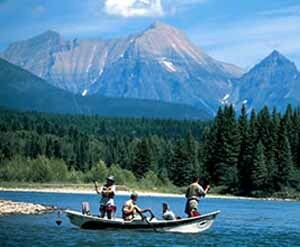 Practice Catch & Release fishing as much as you can. If you are allowed to take your catch home, please eat what you catch. You will feel better for having done so. Have a Fantastic Fish Story to Tell? Do you have a whopper of a story to tell about the one that got away? How about your most dramatic fish catch ever? Share your excitement with the world by writing about it here!! Do you have a picture to add? Great! Click the BROWSE button and find it on your computer. Then select it. That's all you need to do. If your photo is larger than 800x600 pixels, you will need to resize it by using your graphics software or a Web-based resizer, such as Google's Picasa for PC users or IPhoto's Export function on a MAC.